Would you like to be part of what's happening at the Museum? See what opportunities might be a fit for you! MSU Museum Docents are trained volunteers that offer scheduled tours of the exhibit areas of the MSU Museum to visitors and school groups. 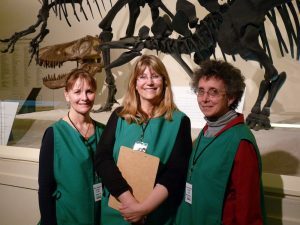 Participants in the Docent Program are trained in basic knowledge of the MSU Museum, educational learning theories, and best practices relating to tour techniques. If you are interested in becoming a docent at the MSU Museum, plan to attend our next training program. Participants are required to attend all of the training sessions, as well as complete required and recommended readings. As a docent we ask that you commit to one year of service and at least two service shifts per month. If interested in joining, please fill out the docent application and criminal background check form OR contact the Education Team for more information. Volunteers serve as the public face of our institution, working directly with museum visitors and providing them with information about the Museum and MSU campus. Individuals can be trained to give orientation talks for group visits. Information Services Volunteers are required to complete a short (30-minute) training module and volunteer at least 4 hours per month. Call us for information 517-432-1472 or email museumed@msu.edu. Teachers, be a liaison for the MSU Museum in your K-12 school! Call for information: 517-432-1472. An internship at the MSU Museum is a supervised work and learning experience that will assist in the preparation for a professional career in museums. Michigan State University Museum offers a variety of internship opportunities including experiences in collections, public relations, visitor studies, festival production, education, and exhibitions. : During the MSU academic year, internships generally last fifteen weeks (an MSU semester). Fall semester usually starts in late August and ends mid-December. Spring semester generally starts in early January and ends the last week in April. During the summer, internships typically run from mid-May through late August, but starting and ending dates for individual internships are negotiable. Work Schedule of Internship: Most interns are expected to work a regular schedule of 9-12 hours per week. Most internships are scheduled during the regular work week (Monday-Friday between 8:00-5:00). A few internships require additional or some weekend and evening hours. Supervisor/Mentors: Each intern works closely with one or two primary supervisors/mentors but also has an opportunity to meet and work with other museum professionals. Interns may also participate in department and museum meetings and are invited to attend museum studies special lectures and workshops. : Interns are responsible for their own health insurance and housing. Interns are also responsible for transportation to and from campus. : Most internships are unpaid though sometimes paid internships are available through special funding. : Academic credit may be possible through academic programs and departments at MSU as well as other colleges. Internships for MSU credit require 3 hours of work for each credit sought. MSU Museum Studies internships require a 3-credit minimum (representing 9 hours/week). Potential interns are encouraged to contact their academic program advisors for information about available credit options. NOTE: Internships at the MSU Museum can fill the requirement of the MSU Museum Studies Program but must have prior approval. For information about other museum studies courses and programs, see: Museum Studies Program at MSU. Interns are expected to treat their internships as a professional experience. Interns should observe the same work rules as other staff members, carry out work assignments productively and efficiently, and accept supervision. >In addition to the activities defined by each specific internship position, students seeking credit through the MSU Museum Studies Program are expected to complete a journal of internship activities, a portfolio, an article review and a short self-evaluation/summary report. Supervisors will also complete an evaluation. : Applicants interested in applying for an internship should fill out the application form (download a form) and send the application, a letter of interest, and your resume to the MSU Museum. Review Criteria and Process: Decisions are made on a revolving basis by the primary supervisor and the coordinator of MSU Museum interns. Selections are made based on appropriateness of candidate to position and availability of internship opportunities (some internships are limited in number at any one time or are only available for specific seasons).